Archduchess Marie Valerie of Austria (22 April 1868 – 6 September 1924) was the fourth and last child of Franz Joseph I of Austria and Elisabeth of Bavaria. Her given name was Marie Valerie Mathilde Amalie, but she was usually called Valerie. Princess Marie Valerie was born at Ofen (Buda) in Hungary. The Empress Elisabeth was especially attached to Valerie, who was born ten years after the imperial couple's third child, and whom she was allowed to raise herself in contrast to her first three children who were taken from her in infancy and raised by the Emperor's mother, Archduchess Sophie. Sophie herself wrote to Elisabeth's mother Ludovika, "Sisi is completely absorbed by her love and care for this irresistible little angel." She was Elisabeth's favorite child by far, and was acidly referred to by some courtiers as "Die Einzige" ("The Only Child") because Elisabeth paid so much more attention to her than her siblings. Valerie loved her mother, but according to her diaries, often felt embarrassed and overwhelmed by Elisabeth's concentration on her, particularly as she herself was of a modest and practical nature. Another of Valerie's nicknames was "The Hungarian Child" because her birth had been a concession by Elisabeth, who disliked physical intimacy and pregnancy, in exchange for Franz Joseph's conciliation with Hungary, her most favored part of the Empire. This process culminated in their joint coronation in Budapest on 8 June 1867, as King and Queen of Hungary. Valerie was born just over nine months later. Elisabeth deliberately chose Hungary as her child's birthplace; no royal child had been born in Hungary for centuries. Had Valerie been a boy, she would have been named Stephan after Hungary's canonized king and patron saint. According to historian Brigitte Hamann, a boy born to the Queen of Hungary in the castle at Budapest would have raised the possibility of his someday becoming its king, separating Hungary from the Austrian empire, and there was universal relief at the Viennese court that Valerie was a girl. Malicious rumors intimated that Valerie was actually the daughter of Elisabeth's friend and admirer Gyula Andrássy, the Hungarian prime minister. These persisted into Valerie's childhood, hurting her deeply. However, she physically resembled Franz Joseph more than any of her siblings, even more so as she grew older, and eventually the rumors died away. Due to the atmosphere they created, however, Valerie developed a lifelong antipathy toward anything to do with Hungary, exacerbated by Elisabeth's insistence on speaking to her only in Hungarian. She was joyful when she was given permission to speak German with her father, whom she worshiped. In addition, she spoke English, French, and Italian fluently, loved to write plays and poems, and was a talented amateur artist who particularly enjoyed painting flowers. She was a great supporter of the Burgtheater in Vienna, and attended its productions as often as possible. In Bad Ischl on 31 July 1890, Valerie married her second cousin Archduke Franz Salvator. They had met in 1886 at a ball, but Valerie waited several years to be sure that her feelings toward Franz Salvator were strong enough to make a successful marriage. It was hoped by many at court that she would marry someone like the Crown Prince of Saxony or the Prince Royal of Portugal, and she was also courted by Prince Alfons of Bavaria. Elisabeth, however, declared that Valerie would be allowed to marry even a chimney sweeper if she so desired (in contrast to her other children, who had both had to make dynastic marriages). Valerie chose for love Franz Salvator, a relatively minor prince from the Tuscan branch of the Austrian imperial family who had no great wealth to offer, and Elisabeth, as promised, supported her favorite daughter. This caused a deep rift between Valerie and her sister and brother Crown Prince Rudolf for a time, but eventually Rudolf became reconciled to the marriage when Valerie and Franz became engaged on Christmas 1888. Valerie's solemn renunciation of her rights to the Austrian throne, which was necessary for the marriage to proceed, took place on 16 July 1890 at the Hermesvilla. The young couple's festive wedding followed in the parish church of Bad Ischl on 31 July. The ceremony was conducted by the Bishop of Linz, Franz Maria Doppelbauer. Afterwards, Valerie and Franz honeymooned in Italy, Switzerland, and Bavaria. Elisabeth Franziska "Ella" 27 January 1892 29 January 1930 married Count Georg of Waldburg-Zeil-Trauchburg, had issue. Franz Karl Salvator 17 February 1893 12 December 1918 died unmarried of the Spanish flu. Hubert Salvator 30 April 1894 24 March 1971 married Princess Rosemary of Salm-Salm, had issue. Hedwig 24 September 1896 1 November 1970 married Count Bernard of Stolberg-Stolberg, had issue. Theodor Salvator 9 October 1899 8 April 1978 married Countess Maria Theresa of Waldburg-Zeil-Trauchburg, had issue, including Princess Theresa. Gertrud 19 November 1900 20 December 1962 married Count Georg of Waldburg-Zeil-Trauchburg, widower of her sister Elisabeth, had issue. Maria Elisabeth 19 November 1901 29 December 1936 died unmarried. Clemens Salvator 6 October 1904 20 August 1974 married Countess Elisabeth Rességuier de Miremont, took the title Prince of Altenburg, had issue. Mathilde 9 August 1906 18 October 1991 married Ernst Hefel, no issue. Agnes 26 June 1911 26 June 1911 died at the age of eight hours. At first, Valerie and Franz lived at Schloss Lichtenegg (Lichtenegg Palace). On 11 June 1895, the couple purchased Schloss Wallsee (Wallsee Palace) on the Danube River from its then owner, Alfred, Duke of Saxe-Coburg-Gotha and completely renovated it. When the renovation was finished, a ceremony marking their moving into the new palace was held on 4 September 1897. There was great celebration of the event in Wallsee due to Valerie's popularity. She was known and loved for her generous involvement in local charitable endeavors. In 1900, she became a patron of the Red Cross, for which she founded hospitals and raised considerable sums of money; she was also patron of seven other charities. During World War I, she created a hospital barracks in the castle itself and helped care for the wounded. She was a devout Catholic who also spent much time supporting religious charities and was known to the people as the "Angel of Waldsee". She was also a Dame of the Star Cross Order. Valerie was greatly affected by the suicide of her brother Rudolf on 30 January 1889, and the assassination of her mother Elisabeth in September 1898. She and her sister Gisela were a great support to their father in the aftermath of these tragedies. While the marriage of Valerie and Franz was harmonious at first, it became less so with time. Franz had many affairs, including one with a dancer Stephanie Richter (1891–1972), who was later known as "Hitler's Spy Princess" for her espionage activities before and during World War II. 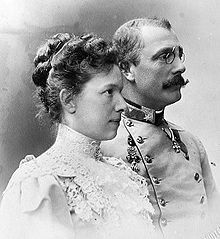 In 1914, she gave birth to a son by him, Franz Joseph, whom he acknowledged as his while Valerie was still alive. Valerie faced these blows stoically, confiding only in her journal. After the end of World War I, Valerie officially recognized the end of the Habsburg monarchy and signed documents renouncing all rights toward the same for herself and her descendants. The renunciation allowed her to keep her home and possessions. Valerie died in Schloss Wallsee on 6 September 1924 of lymphoma. Shortly before her death, her sister Gisela wrote in a letter, "I must add that I have seen Valerie - fully conscious, completely aware of her condition, and so devoutly accepting, even joyfully anticipating her impending departure, that I believe an unexpected recovery would actually disappoint her." She is buried in a crypt behind the high altar at the parish church in Sindelburg, Austria. Several thousand people followed her coffin to its resting place. On 28 April 1934, ten years after Valerie's death, Franz married a second time, to Freiin (a title corresponding to "Baroness") Melanie von Riesenfels (20 September 1898 – 10 November 1984). This was a morganatic marriage; the wedding took place in Vienna. The pair had met after Valerie's death at Melanie's home, Seisenegg Palace, where she lived with her sisters Maria Anna and Johanna. After their wedding, the couple lived at Seisenegg. Franz Salvator died on 20 April 1939 in Vienna. The Mária Valéria bridge joining Esztergom and Párkány (Slovak name: Štúrovo) in Hungary, across the River Danube opened in 1895 is named after Marie Valerie. Wikimedia Commons has media related to Archduchess Marie Valerie of Austria.